Vancouver, BC-bound Coast Starlight departs from Union Station. Photo by Dad. Please do not repost without crediting us. Yesterday, Will visited Los Angeles Union Station for the first time. 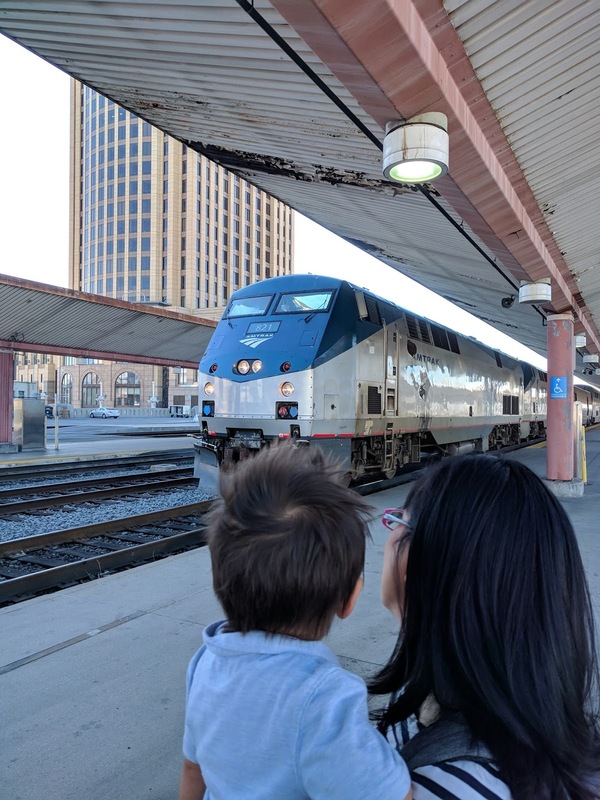 We arrived at about 9:45 am and were able to see three trains depart in about a 15 minute period, including the once-daily Amtrak Coast Starlight bound for Vancouver, BC. TAP staff were on hand to help customers buy and load passes and stored value on TAP cards and to answer questions. We enjoyed introducing staff to the first child we knew of named after the Westside Subway Extension. Finally, we were able to buy the commemorative TAP card printed in honor of Metro’s 25th anniversary. With my commemorative TAP card! Union Station is gorgeous and bustling with activity, a public space that I think is now on par with Grand Central Station in New York City and Union Station in DC. What we have over those two marquee transportation hub are these beautiful, and accessible, outdoor gardens. There are two, one attached to the Metropolitan Water District and the other specifically to Union Station. What I love most about visiting Union Station these days is the aura of discovery. I visit only occasionally so there is always something new whenever I come to visit.